Wild Parsnip (Pastinaca sativa L.) is very common in many parts of Vermont. The plants grow wild along roadsides and other unmaintained areas and produce yellow flowers that look like Queen Anne’s Lace. Although this is the same plant as the common garden parsnip we eat in soups and stews, the flower heads are the second-year growth from the carrot-like roots. It is a close relative of carrots, parsley, angelica, and giant hogweed, all of which can cause similar skin reactions in sensitive individuals. Wild parsnips produce a sap, or plant juice, that can cause burns to the skin in the presence of sunlight. In some cases, the burns are like second-degree sunburns that can cause painful rashes and raised blisters. Wash your skin thoroughly with soap and water as soon as possible. Protect your exposed skin from sunlight for at least 48 hours. If you experience a skin reaction, call your health care provider. 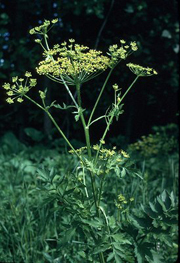 The Health Department advises people to stay away from direct contact with wild parsnip sap. Avoid skin and eye contact with the sap. Wash clothes that come in contact with the sap. Work with the plant on cloudy days. Always wash your skin immediately after coming in contact with the sap. Arsenic is a natural element found in rocks and soil and is often found in well water. It can also come from human activities and is used in some consumer products. Over time, arsenic causes cancer along with other health effects. Volatile organic compounds, or VOCs, is the name given to substances that contain carbon and evaporate or “off-gases” at room temperature. Dry cleaners use chemicals to clean clothes and other fabrics. When these chemicals are breathed in, they can be harmful to your health. They can remain in the environment for decades. Benzene is the name of an aromatic hydrocarbon, C6H6. In liquid form, benzene is clear, colorless, and flammable. Formaldehyde is a colorless gas at room temperature that sometimes has a noticeable smell. At room temperature, metallic mercury is a shiny, silver-white liquid. Breathing in vapors of metallic mercury can cause health effects. Ozone is a colorless gas with a noticeable smell. Although ozone is naturally found in the atmosphere, it is also a main part of air pollution called smog. “Particulate” is a general name given to a tiny solid or liquid particle or piece of matter. It usually refers to particles in the air (airborne particulates).